Amongst all of the soap news and designs, you (and I) may have forgotten that I also spend a fair amount of time digital scrapbooking, too! For each of the past 3 years I have created a big, single digital scrapbook that encompasses the entire year in its pages. I’m excited to have finished album #3 this weekend! 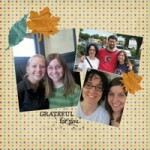 Family Life 2010 is finally complete. Below are a few example pages, check out the full album on Flickr. 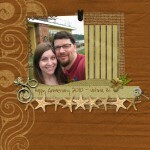 The Family Life albums are each between 40 and 50 pages of digital scrapbooking goodness, showing off major milestones and events that took place throughout the year. In addition to the Family Life albums, I have also created scrapbooks for other things; my nephew’s first year, my wedding, and other family albums for gifts and in memory sentiments. Not ALL of them are online, but you can find a few other completed albums over on my family Flickr account… such as our Wedding Album, the album I made as a wedding gift for Lucas, and our Christmas 2007 album; my first digital scrapbook ever. So what on earth do I use to digital scrapbook? For those of you new to my craft blog in the past year or so with the rise of GEEKSOAP fame, you may be wondering. 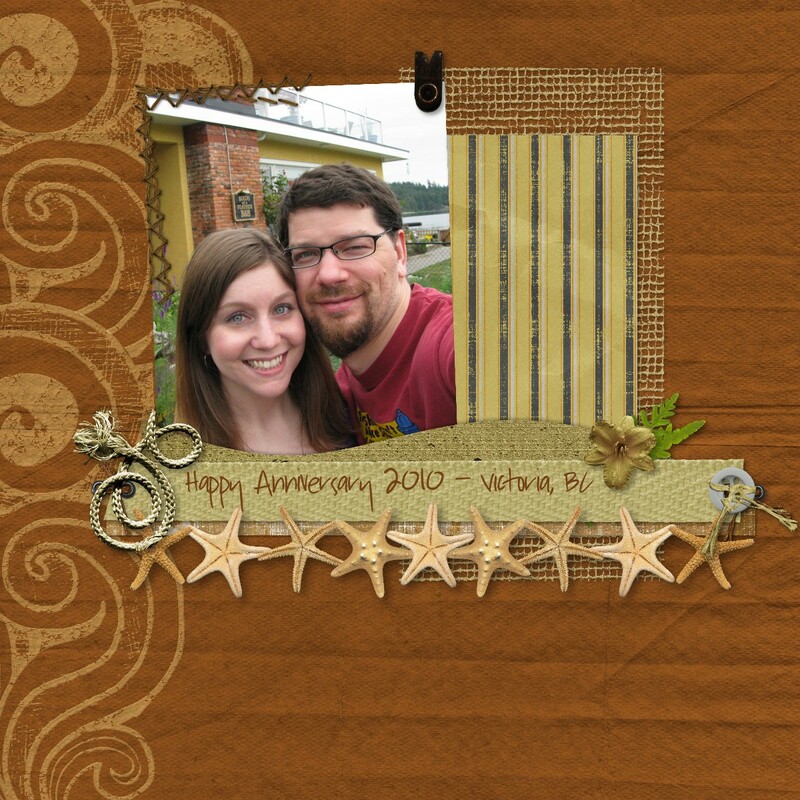 For those of you that have been around for several years, you know how much I am in love with My Memories Suite, the greatest digital scrapbooking software of all time. Literally. As a quick backstory, I learned of My Memories Suite back in 2007; I had moved to Canada and was waiting (patiently) on my immigration status and then finding a job. This meant I was home during the day a lot, and one day in October, I got sucked into an infomercial for this amazing new digital scrapbooking software. I’m normally pretty skeptical of infomercials, but My Â Memories Suite looked like the real deal. It just so happened that I had been physically scrapbooking for years prior, and was currently in the middle of scrapbooking my Canadian adventures since moving to the great white north. The problem was that I’d run out of supplies or glue or cute embellishments or paper and just hadn’t gotten around to buying more. I had taken over an entire cabinet of drawers in our basement in Calgary with scraps of papers and various scrapbooking supplies and it was a mess. The idea of digital scrapbooking and using digital products that I could design myself or download from others was intriguing. By the end of the infomercial I had already ordered. The only problem then was that My Memories Suite was new and only available in the U.S. No worries; we were planning to visit my family in Indiana for Christmas. I had My Memories Suite shipped to my parents and patiently awaited for December so that I could get my hands on it. Something interesting to note is how my albums have gotten better over the years. 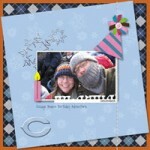 I’ve been using My Memories Suite since December 2007, and every year I use it to scrap my life I get better and better and there’s more and more awesome digital scrapbooking resources out there to use with the software. DigiFree, which I talked about in my review back in 2008, has since moved to Craft Crave, but they are still out there and full of awesome downloadable digital scrapping freebies every day that you can use with My Memories Suite. Not to mention, My Memories Suite itself has designers that create beautiful new kits and templates that you can purchase via the online store. I’ve got a few bookmarked in my wish list until next month when we find out whether we’re having a boy or girl so I can get started working on my baby book. Speaking of expecting our first child, that’s what’s inspired me lately to get moving on finishing my Family Life 2010 album so that I could begin work on baby stuff. Call it nesting, call it me being organized and/or OCD, but I can’t wait to include the geekling in our Family Life 2011 album and create a separate brag book album for my family to celebrate the birth of our first child. I’ve fallen in love with dinosaurs as a “theme” (boy or girl!) and found some really fantastic scrap kits out there last night that I purchased to use with My Memories Suite. I can’t wait to start working on those layouts! Interested in My Memories Suite? Read my review and then go and purchase it – due to my affiliation and recognition from the company for my tutorials (and I literally help a handful of people daily via email with MMS questions! ), I’ve been given the ability to offer a discount if you are interested in purchasing the software! What are you waiting for? Time to get scrapping! The stores both “closed” on December 21 and will re-open on January 3; I’m finally taking a well deserved break and recuperating from the madness of the holiday rush so that I can restock all of my supplies and products for both stores. Â I’m also using this break to focus on creating some new geeky soap designs that I think you’ll like a lot when I release them in early January. :) Thank you so much for making this season so amazingly successful! 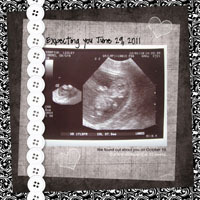 On a personal note, you may have heard that my husband and I are expecting our first child in June. We could not be happier to finally be starting a family! Thanks for all of the well wishes we’ve received since we made our announcement public on December 1; this is going to be one geeky baby! We’re expecting the geekling to arrive sometime at the end of June and you can keep up with all of the baby details over on our personal blog. We’ve also put together a baby page on our personal site that we can update along the way to keep our friends and family in the loop with info. We’re really looking forward to the adventure of becoming parents for the first time! So that’s it around here! So much good stuff on both my small business(es) and personal fronts that I can’t help but be thankful for all of the people who have supported me along the way. I am truly blessed! 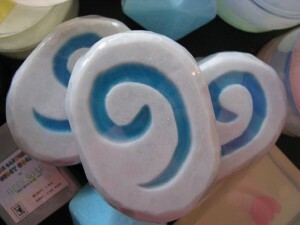 *love* Look for some new goodies coming to GEEKSOAP in January and thanks for all of your holiday orders. Hope you and yours had an a wonderful Christmas full of awesome and win. Happy New Year! A New Storefront for The Pink Toque! I have some exciting news for The Pink Toque! 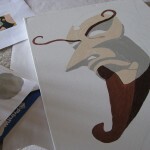 A lot of you know that I’ve been around blogging about my crafty endeavors for over four years now. In fact, it was four years ago this month that I opened my Etsy store and started selling purses, bags and custom plush. 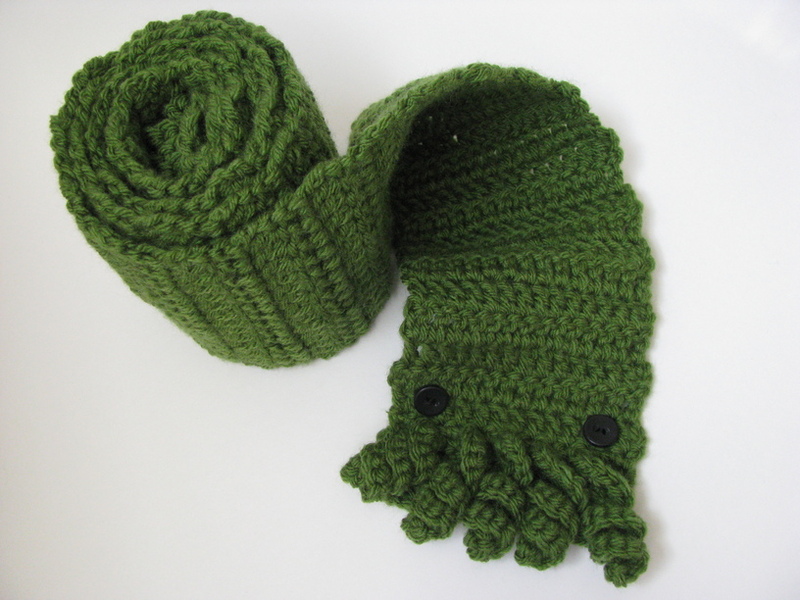 When I designed The Cthulhu Toque and its companions the Baby Cthulhu Toque and the Sockthulhu plush, they were sold in the Etsy store, too. 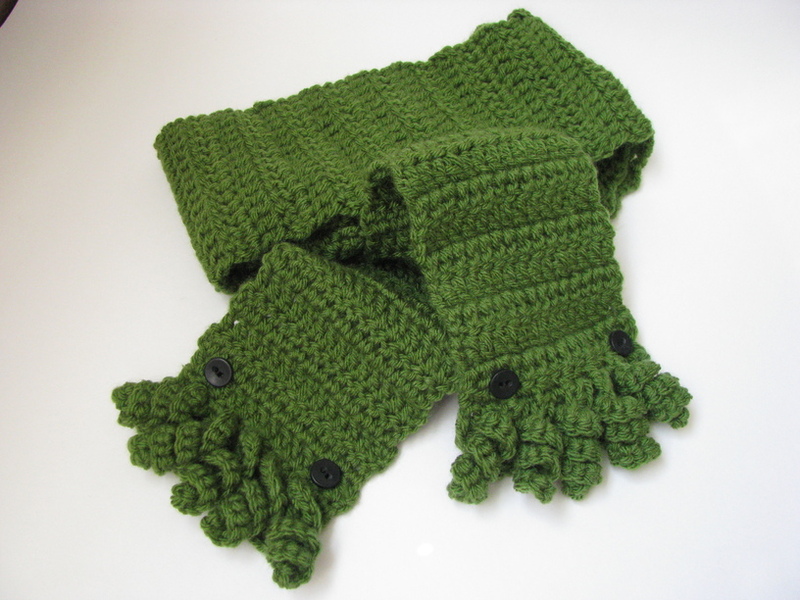 Last fall and winter were the first BIG seasons for my Cthulhu crochet creations; though I had designed the toque before then, it didn’t take off until the seasonally cool weather set in. 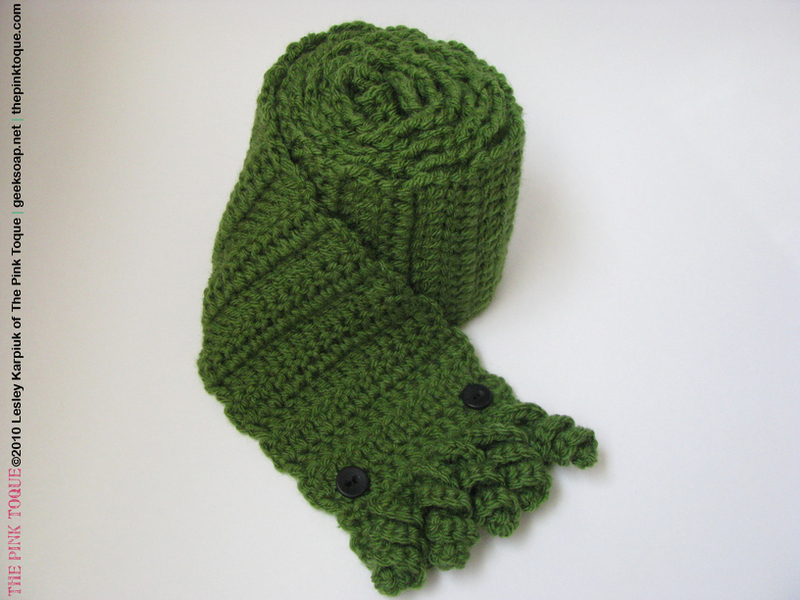 Now that we’re starting to experience some cooler temperatures and we’ve officially said goodbye to summer this year, I’ve been getting requests again to have the Cthulhu Toque available, and I’ve also seen an increase in its pattern sales on Ravelry this past month. I’d been playing with some new Cthulhu crochet designs recently, and so this year I decided to create a new storefront just for my geeky fiber arts creations and release some new accessories there, too! Introducing… The Pink Toque shop! No longer am I using Etsy to sell any of my stuff. 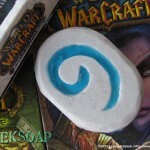 The new shop is in addition to my GEEKSOAP storefront at geeksoap.net – most of you already know that GEEKSOAP is just one storefront of mine that’s strictly my line of original handmade geeky soap, and the Cthulhu Bath Mitt since that logically goes with soap. 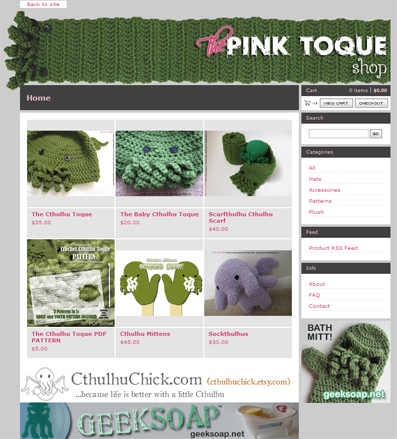 However, The Pink Toque shop is a new and separate storefront hosted on BigCartel instead of Etsy, and there you’ll find my Cthulhu Toque, the Baby Cthulhu Toque, and some new and exciting crochet designs of mine… such as the Scarfthulhu Cthulhu Scarf and coming soon… Cthulhu Mittens! 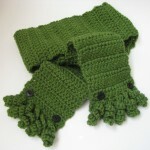 Wait, a Scarfthulhu Cthulhu Scarf?! Yes, that’s what I said. Isn’t it awesome? Both ends of this 63″ (over 5 ft!) original scarf feature 100% handmade tentacled Cthulhu goodness that will keep even your soul warm and protected from the elements. Or maybe it squeezes your soul right out of you; I forget. Either way, you can’t deny how cool it will make you look in the cool weather. 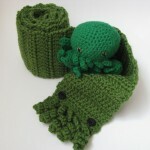 And paired with the Cthulhu Toque? How can you go wrong?! So now there are two places you can go to get your hands on some original creations of mine – geeksoap.net for soapy goodness and shop.thepinktoque.com for all of my geeky fiber designs. 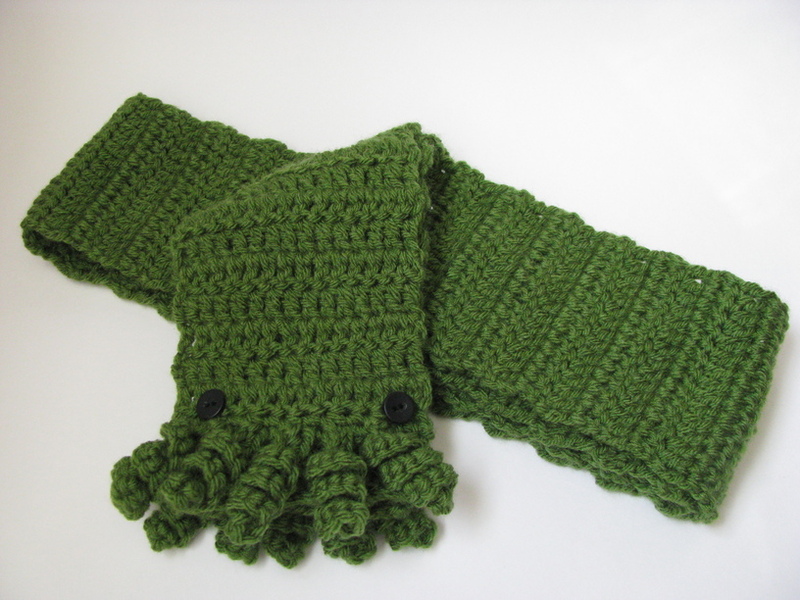 I think you’ll love the addition of the Scarfthulhu to kick off the additional store with something new, and the mittens will be fun, too! I’m still working out a few kinks with their design, but hope to have them up in the next month or so. 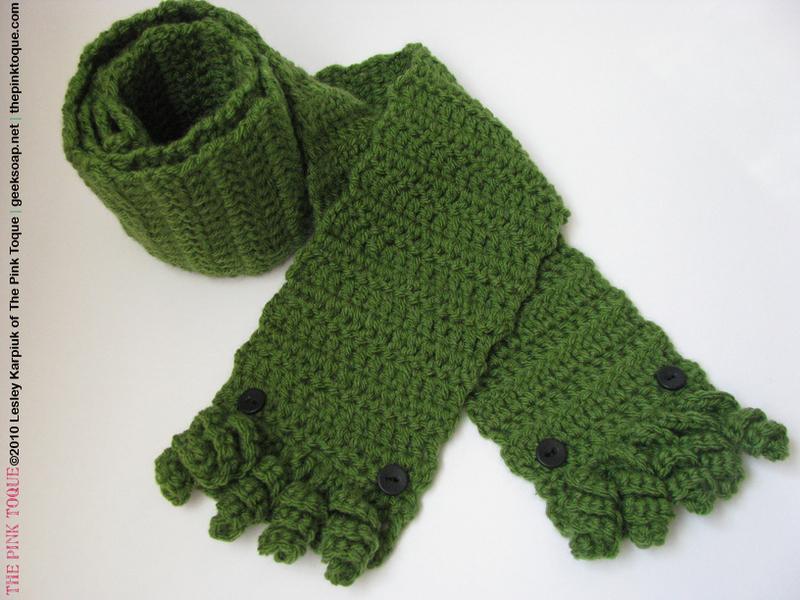 That means you’ll soon be able to own an evil yet full and fashionable set of Cthulhu accessories to keep you warm this winter! Remember to look for my creations in two places now! 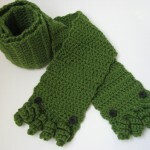 My handmade, vegan friendly geeky soap designs are still at geeksoap.net, and now you can find my original, wearable crochet Cthulhu accessories available at shop.thepinktoque.com. Hope you enjoy! I know, I know. It’s been awhile since I’ve posted, but I’ve been busy! (Excuses, excuses.) After Gen Con I started a brand new, amazing job right away, and then Lucas and I just moved closer to my work last weekend. Between the new job (which used to have a long daily commute), continuing to create huge amounts of soap to fulfill customer orders, and our recent move, I’ve not had as much time to create other things or update. Now that we’re finally settled, I’m excited about how inspired I am to get crafty again to create new works of art to decorate our new home. 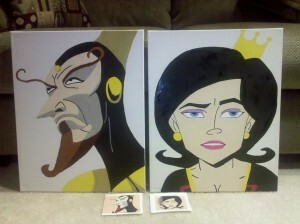 I based my paintings on images I found online of the pair, which came from screen captures taken from the show. You can see the images I used on the floor in front of each painting in the first photo. The Dr. Mrs. The Monarch was originally going to be done Ã Â la Dr. Girlfriend, but as I worked on her I decided to modify the design to transform her into the Queen Butterfly instead. It seemed fitting; the paintings will soon be hanging above Lucas and I’s matching computer desks next to each other in the new office, and the color scheme of the two together will be more consistent. It’s been awhile since I’ve painted; I was so tickled with how well these turned out that I may just have to do a few other pieces for the new place. Besides painting, I’m also excited about some digital art I created for our guest bathroom, which I am using to display some geeky-themed soap of mine and @KyleeLane‘s. 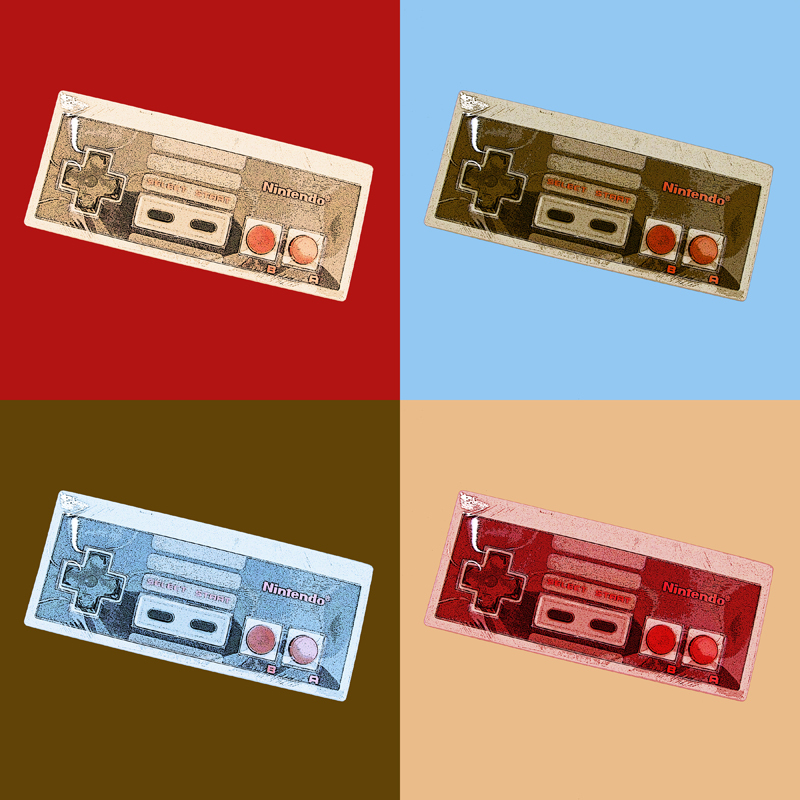 IÂ envisionedÂ this Andy Warhol-esque design of my Game Cartridge soap and Kylee’s NES Controller soap. I wanted the colors used to match the four colors of the shower curtain and accompanying accessories to tie everything together between the curtain, the walls, and the soap on display. These will be printed at 12″ x 12″ and I created them in Photoshop using photographs I took of our soap. Not bad, hey? I can’t wait to see them up! Wow. Just… wow. Gen Con Indy was amazing! Thank you SO much to all of the fabulous people that stopped by our booth and supported handmade geek at the best four days in gaming! Firstly, we have SO MUCH LOVE for all of the independent geek artists that made upÂ G33Kmade’s booth. Though Kylee and I were there as the face promoting our cause, G33Kmade was more than just soap; we had amazing prints by GEEKLEETIST, fantastically detailed nerd pillows by Victoria the Germ, and epic dice bags designed by Lyndsay of Dragon Chow. Â And not only that, we also represented other featured G33Kmade artists and friends such as GeekyCookies, UberDork Cafe, and Ruth of CthulhuChick, whose plush Cthulhu was our booth mascot. We were givin’ out super sweet geeky buttons made by Wendy of GeekyBoutiquey left and right, and tried to ensure our mission of spreading the love between everyone that made G33Kmade’s booth a success to anyone that would listen. And boy, did we have a lot of listeners! Wil Wheaton came by the G33Kmade booth on Saturday and picked out a Dragon Chow dice bag as part of his mission to collect as many dice as possible at Gen Con. Getting a Dragon Chow dice bag was part of another spread-the-love geeky mission initiated by @cmdrsue via Twitter. It’s the kind of thing that makes you feel weak in the knees and love what you do that much more: seeing so many people come together under one banner for one awesome purpose… to support each other’s handmade geek. It’s the foundation that G33Kmade was built upon. Share. Support. Promote. Love. Geek. Wil picked up some of our soap sculptures of awesome offerings and chose a dice bag. When he realized what G33Kmade was and what we were all about, he told Kylee and I how PROUD he was of us. Of what we had started with G33Kmade. Of promoting independent geek artists and all of us working together. The fact that so many of you were on board doing this together. He compared it to how he got started and all of the people he’s worked with, and just kept repeating how proud he was. It was surreal. And awesome. Who would’ve thought? Independent artists working together. G33Kmade is not just two people. It’s one giant geeky dogpile of epic proportions and each and every person supporting us – whether from the sidelines or as a featured artist – is an important part of that pile. It really was amazing to see how well received the whole concept was. People loved hearing stories about the artists of G33Kmade as they browsed geeky wares from all over North America. They were surprised to see Kylee and I selling soap side-by-side and promoting and cheering each other on instead of competing. But that’s what it’s all about, and the warm fuzzy feelings I got from being able to work with so many thoughtful, giving geeks had me glowing all weekend. I am proud to be a crafty geek. The famously clean superheroine you all know as @DeodorantDame even came by so we could help aid her in her quest for cleanliness at cons everywhere! Equipped with her deodorant spray and a D20 Soap on a Rope, she was unstoppable. United we stand for a meaningful cause! THANK YOU to every single person who has supported G33Kmade. Handmade FTW! As you can imagine, it’s been busy ever since Gen Con around here. On a personal note, I got a job offer for a school district on the north side of town about 10 minutes before our Gen Con booth opened, and started said job at 7:30am the Monday morning after Gen Con. The good news is that the job is amazing; I love it! The bad news is that it’s an hour commute for now, so not only am I juggling a successful small business in what little spare time I have, I also have a new full time job AND we’re planning to move in a few weeks to be closer to work. As if I needed more things on my plate, Lucas and I are going with a bunch of friends down to Atlanta, GA next weekend to attend Dragon Con, too. Should be a really fun time! 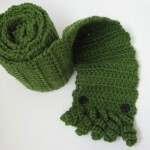 In crafting news, expect a few new little things coming to GEEKSOAP soon, and my Cthulhu Toque should be back in stock both on Etsy and over on geeksoap.net in the next few weeks as we get closer to fall and hat season. I’m also planning a slight redesign to my Baththulhu Cthulhu Bath Mitt pattern to create Cthulhu Mittens for this holiday season as well :) Oh, and did I mention that Lucas and I are trying new recipes each week and attempting to stay on top of our family blog, too? Stay tuned! Somehow I’ll accomplish all of this in the midst of a move ;) Take care! Ahhhhh… I’m back in Indiana after a 10 day hiatus to Canada with a little time spent in Seattle, WA along the way. Lucas and I had a fantastic time and spent our anniversary in a beautiful bed and breakfast on the ocean near Victoria, BC on Vancouver Island to kick off our Canada Summer 2010 Tour. After a few days of relaxing we headed over to stay with family in Vancouver and see the city, followed by a pass through Chilliwack and on to the wonderful Penticton, BC, where Lucas grew up. We enjoyed some beach time and got to see family and friends there, too. We flew in and out of Seattle, WA, so we made sure to head back to Seattle a day and a half before our flight so that we could experience all of the fun that downtown and the waterfront had to offer. We seriously could’ve used another couple days there. What a great time! Of course, being gone for 10 days meant I had a huge backlog of orders waiting for my personal attention when I returned, and I truly appreciate everyone for being so understanding with me being out of the country and all! I’ve gotten back on schedule right away, and I’m working on your orders as quickly as I can. :) And getting right back into the swing of prepping for Gen Con. Can you believe it’s just over a month away! Still lots of soapy goodness to work on, but there is a light at the end of the tunnel! So… let’s introduce my newest soap already. (It’s like I can read your mind, right?) *drum roll* … Introducing the Soapstone! Some backstory first, k? I have had a very lengthy relationship with WoW, dating back to January 2005. (I tried EQ2 in Nov 2004 first… you can see how long that lasted since I had moved on by January.) Besides just plain playing, I’ve been featured twice on the official World of Warcraft website front page, and for over 2 years I wrote for Mentor Media/38 Studios as a paid staff writer and then editor with the Azeroth Advisor. I had a brief stint with WoWHead but was too busy to keep up and had taken a break from the game for a bit. I’ve taken breaks off and on in the more than 5 years I’ve played, but Azeroth always calls me back… and my most recent return brings the Soapstone along with it. Lucky you! 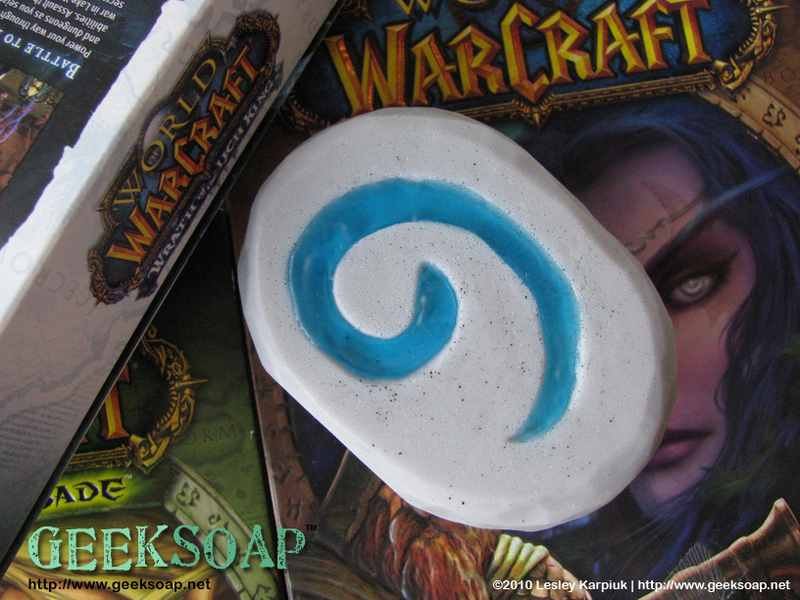 The concept of this soap design in particular is nothing new – I’ve always been inspired by ManaPrincess/Amethyst Soap and their hearthstone designs, but for the longest time I kept telling my customers I’d not make one because it had “already been done before.” I take great pride in the fact that ALL of my previous soap designs are unique and original – not only in the construction of how I do some of my signature soap, but before me there was no such thing as Dr. Who soap, or Game Cartridge soap. Or D20 Soap on a Rope, or Cthulhu soap… just to give a few of the many examples. 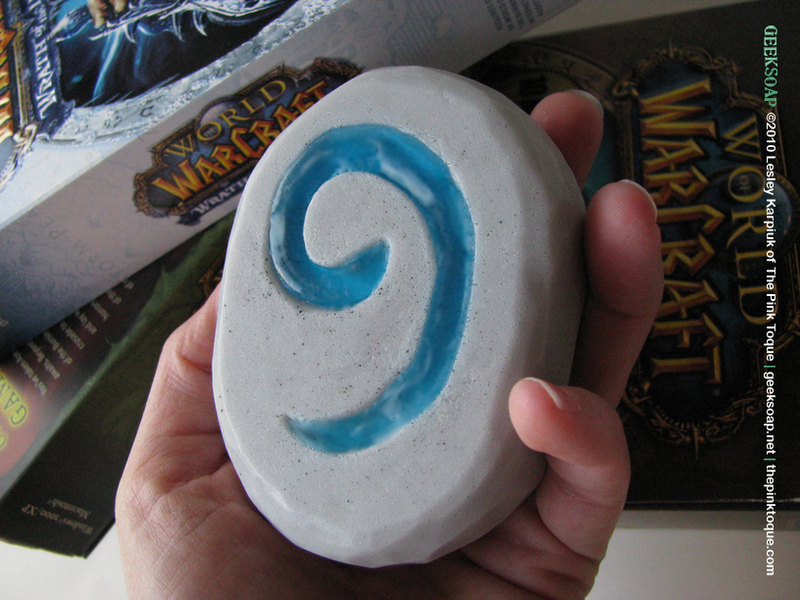 Then it was brought to my attention that these crafty people were no longer creating and/or selling their hearthstone soap. That’s when I approached the previous makers because I wanted to create my own vision that depicted what *I* thought a hunk of carved stone would look and smell like. This means I’m not competing with either person’s sales or trying to take any of the credit for their idea. Special thanks to Margaret of Amethyst Soap – she has been a completely amazing person to work with as I designed my own unique handcarved version. Her support meant a lot in my quest to capture the essence of “home” in a bar of soap. Â Thankfully I completed the quest successfully, and was rewarded with an epic shower and smelling great. Yes! OH! And before I forget… I’ve been tweeting about it, but want to make sure I cover it wherever I can… my Ninja Turtle GEEKSOAP Guest Soap set is ready to be released, but instead of just releasing it per usual, I’ve given my friend Tommy over at @SaturdayMorning (Saturday Morning Central) the very first set to give away in a fun TMNT contest they’re hosting! So not only do I have the new Soapstone out and 2 new soaps announced on the way, I am also finally debuting the Ninja Turtle soap via contest! Once the winner has received their set from Saturday Morning Central’s contest, I’ll release the soap in my store so it can finally be made available to the masses. :) Get over there and enter the contest already, you know you want to! 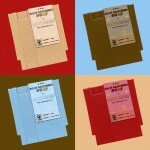 GEEKSOAP News & Support UberDork Cafe! So what’s the vacation for? Well, Lucas and I’s anniversary is coming up on Sunday, and it’s our tradition to stay in a bed and breakfast on the ocean over our anniversary. Last summer we did Nova Scotia and I still daydream of the place we stayed at. I think the sound of the waves crashing up through the open patio door all night is the most relaxing thing ever! This year we’re going to Vancouver, which is a good choice since it means we get to stay on the ocean (we’re actually going out to Victora on Vancouver Island for 2 nights at a bed and breakfast there) and also head inland a little bit to visit friends and family. I’ve not yet been to Vancouver, so I’m excited about exploring after our getaway on the island. We’ll visit Lucas’ uncles and Matt and Laresha (brother and sister-in-law) and then head even further inland to spend some time in Penticton, where Lucas grew up, to visit his parents and some more friends. I can’t wait! I’m working extra hard this week in the GEEKSOAP soap studio to prepare; not only am I working on orders daily, I’m also still prepping for Gen Con in August! Whew! When I return you can expect some new goodies, too! I’ve got 2-3 new soaps coming PLUS a rumored 3D Dalek soap from Dr. Who…. that won’t be ready immediately when I return, but it’s in the works! ALSO, the awesome Cthulhu bath mitt I designed and crocheted will also be made available. 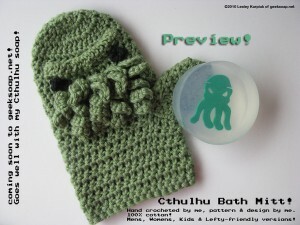 I will be calling it the Baththulhu Cthulhu Bath Mitt, and it’s extra cute! Currently I have a mens and womens’ size as well as being able to make it in a lefty-friendly design. 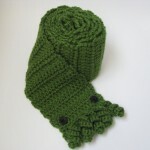 It’s 100% original and made from super soft 100% cotton; perfect for getting clean with my Cthulhu GEEKSOAP! 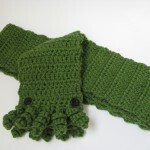 The Baththulhu mitt will be my FOURTH original Cthulhu design since 2009… first it was the Cthulhu toque (and a baby toque that came out last year), then it was my Sock-thulhu Cthulhu plushie in late 2009, then my Cthulhu soap came out in January 2010 and the Baththulhu mitt will be out July 2010! Exciting! So that’s the news for where GEEKSOAP is right now, and what you can expect to see from me soon! 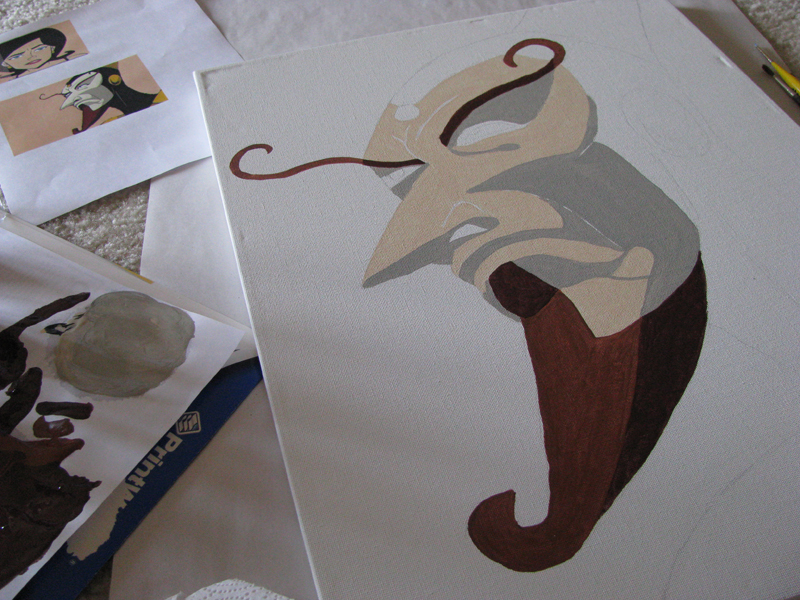 Now I need to turn your attention to something incredibly awesome… my friend Natali (AKA @UberDorkGirlie) is amazing. She has this dream of a super fantastic geeky cafe that she calls Uber Dork Cafe – a family-friendly place where art and science and geek come together to provide patrons with a completely fantastic cafe experience – and she needs your help! Uber Dork Cafe was granted a pledge page at Kickstarter, where you can help pledge your support to various ideas and creations by all kinds of people and their dreams. Please go check out Uber Dork Cafe and pledge any amount that you can to help Natali fulfill her dream! More ways to support UberDork Cafe: Head on over to the Facebook page and follow @UberDorkCafe on Twitter! Wow. A lot has happened since my last post and there’s so much awesomeness and good stuff that it’s a little overwhelming. Awhile ago, @KyleeLane and I had a vision. A dream. A great-minds-think-alike idea that we’ve set in motion to become something completely amazing. As geeky crafters, we were dreaming of a place where other geeky crafters could come together and be promoted and shared with the world. We wanted to showcase the crafty inspirations, history, and all of the things that go into creating something original by hand. A celebration of geeky craftiness and handmade for the greater geeky good. And G33Kmade was born. Geek stuff because geek stuff is â€œcoolâ€ is merely demographically targeted marketing (e.g. â€œpunkâ€ after the 1980s), whereas *true* geeks want the people making the stuff to be as obsessed as they are about time travel, software libraries, or medieval Germanic Lit, or whatever. Once you compare even mediocre handmade things with mass produced, handmade always wins. But what if you’re not crafty? How will G33Kmade benefit you, you ask? Simple. Use G33Kmade to browse artists or crafts that you may not have otherwise stumbled upon on. Looking for the perfect geeky gift? Handmade is always better, and you’ll be able to sort through just about everything under the sun with a geek theme to fit any occasion or satisfy anyone’s geek tastes. So it’s a positive thing for everyone involved, and that’s the major underlying feel: positivity! Spreading the love of geeky crafts and promoting artists and handmade. Sharing ideas, how-tos, projects, and inspiration. Providing a place to showcase all of this awesomeness together. If you’re a geek, you’ll love G33Kmade whether you make things or not, because seeing what others are doing out there and why is hugely fun and interesting. Did I mention inspiring? See, now I’m gushing. I’m really passionate about G33Kmade and all it stands for. THIS is the way it’s supposed to be. It’s not about competition, it’s about supporting each others’ passions. I’m really excited to have found someone who holds the same values about handmade art, to spread the love instead of negativity, and roll all of that positive energy up into something that benefits everyone… and that’s Kylee. Even more fun and exciting is that G33Kmade will have an Exhibitor’s booth at Gen Con in Indianapolis this August to sell some handmade geek at the biggest 4 days in gaming. We’re also planning a G33Kmade Gen Con Tweet Up to accompany that – more info about that will be announced over at G33Kmade in the coming weeks. So there’s LOTS going on around here. Besides all of this good stuff I’ve got orders up to my eyes and some really fun other crafty projects in progress. 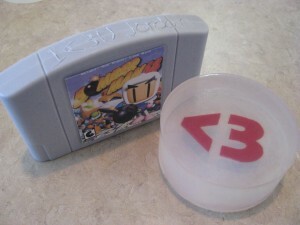 You should SEE this awesome custom order I just completed of Handheld Game Cartridge GEEKSOAP bars as wedding favors! Whew :) I have a week left of this school year, and then the summer off to focus hard on G33Kmade, prepping for Gen Con, and selling more and more GEEKSOAP! Next month is Lucas and I’s anniversary, and in keeping with the tradition, we’ll be staying in a bed & breakfast on the ocean… this time on the west coast in Vancouver, BC. We’re looking forward to a trip back to Canada and will be able to see a lot of Karpiuk family while we’re out that way. Score! Who knew gaming could be so romantic? This story and custom order truly melted my heart. So geeky. So romantic. With the customer’s permission, I just had to share. I enjoy doing gift sets and custom requests for orders, especially when the end result is being shipped to a friend or loved one. I take great pride in knowing that someone feels my handcrafted soap is worthy of a special gift for a special someone in their life. I really enjoy adding little handwritten personalized notes from the customer to gift orders and imagining the look on the recipient’s face when they open the box and see my soap. 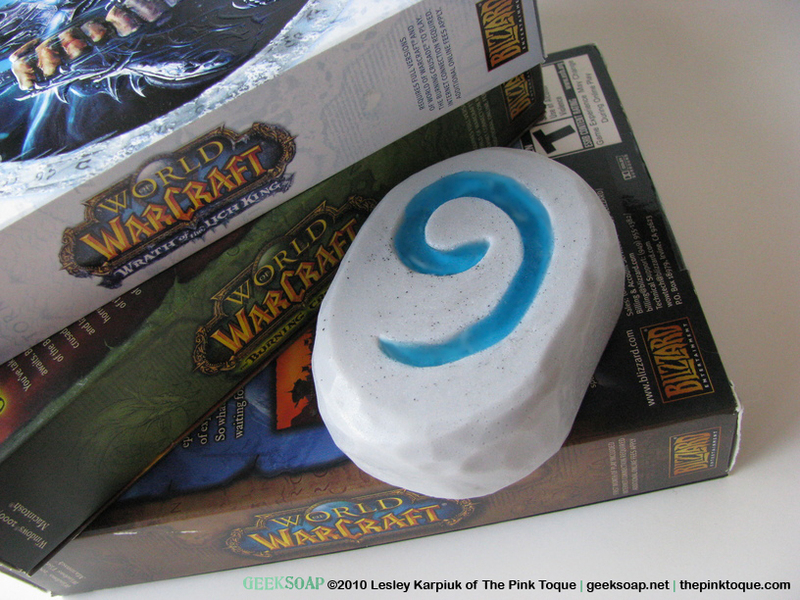 This week, I received an interesting custom order inquiry that would put a bar of my geeky soap in the middle of a budding romance between customer, Chris, and his girlfriend, Jordan. Super squee, right?! 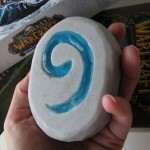 I found Chris’ request for a special bar of soap to represent how he asked his girlfriend out as a token of love hopelessly and completely romantic. How could I *not* complete this amazing request? (And seriously? Bomberman64? Awesome.) 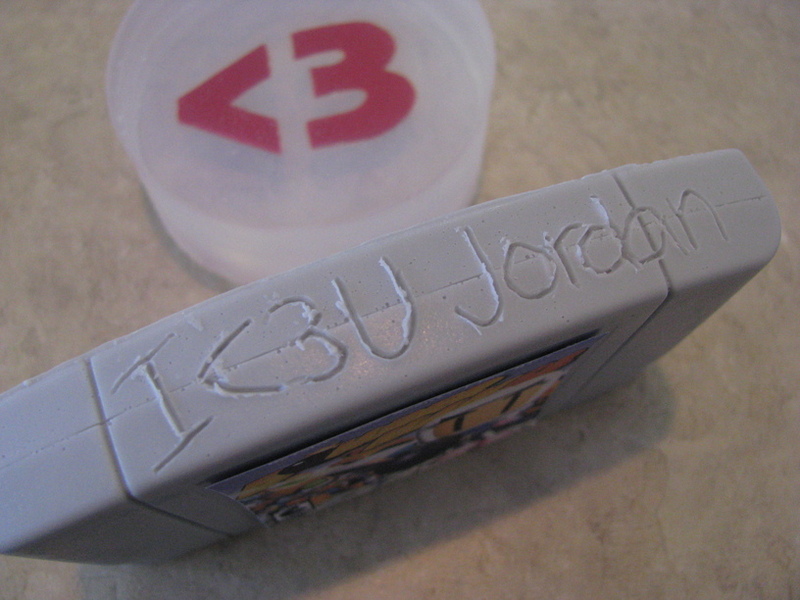 But that wasn’t all… Chris had a side-quest for me; he also wanted a sweet little personalization carved into the top of the cartridgeÂ to sendÂ a note to Jordan. 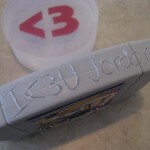 (Ã la carving your name into a cartridge so you knew who it belonged to.) And a <3 heart emoticon soap to complete the package. I only wish I could witness the look on Jordan’s face when she opens the package and receives her sentimental soap inside, complete with a notecard bearing a custom message from Chris. It makes me sigh one of those big happy lovey-dovey sighs just thinking about it!